Hines says it could deliver as many as 1,500 beds in the coming years. 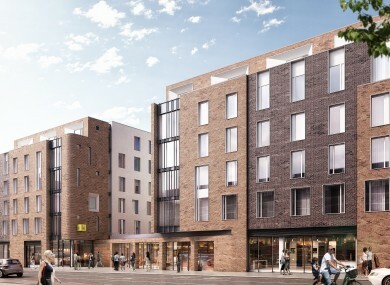 US REAL ESTATE giant Hines has just announced a big move into the Dublin student accommodation market and said it could deliver as many as 1,500 beds in the coming years. The firm announced today that it has acquired four assets in the centre of Dublin on behalf of a group of German pension funds. The portfolio has been acquired from ThreeSixty Developments, a student housing developer managed by Oaktree Capital Management. Hines said that the four assets will deliver around 1,500 new beds for Dublin’s growing student population. “The Binary Hub, located in the heart of the city, was completed in July 2016 and provides state-of-the-art accommodation across 470 beds,” it said. “Developments in Dorset Street and Summerhill are due to complete in 2017 and 2018, providing 450 and 400 beds respectively. The transaction represents Hines’ second major student housing deal in 2016, after it acquired of six development sites across the UK from McLaren Property earlier this year. Hines said that the expansion into student housing forms a key part of the company’s strategy of moving into different types of assets. The business already has a large portfolio of office, retail, industrial and residential investments. Alex Knapp, Hines head of student accommodation, said that Ireland “is an exciting growth market”. He said that the firm is looking at further opportunities to grow its portfolio “both in Ireland, the UK and elsewhere in Europe during 2017”. Brian Moran, head of Hines Ireland, said that Dublin “is home to four of Ireland’s eight world-ranking universities and has a vibrant, dynamic student population”. Hines, a privately owned global real estate investment firm, was founded in 1957 and has a presence in 192 cities in 20 countries. The company has $93.2 billion of assets under management and is one of the largest real estate businesses in the world. Hines is one of several developers looking to move into the Irish student accommodation to cater for pent-up demand. Several months ago Ziggurat, one of the largest student-accommodation companies in the UK, told Fora that it plans to spend hundreds of millions of euro developing new facilities in Ireland while planning permission for a 571-bed student accommodation development in Dublin was granted earlier this week. Email “1,500 student beds on the way to Dublin thanks to major US developer ”. Feedback on “1,500 student beds on the way to Dublin thanks to major US developer ”.